Sunrise, FL – What a weird way to end the season. I wish the Cats showed this much fight before they were eliminated from the playoffs… That’s sort of harsh, but the guys only showed competence on one side of the ice. In the month of March, the Florida Panthers scored 56 goals (T-1st in NHL) and led the league in power-play percentage (28.9). However, they also allowed the 2nd most goals in that same timespan. On an individual level, several Panthers are having a career year. Coming into tonight’s game, Evgenii Dadonov had 69 points. Mike Hoffman led the squad in goals scored (35), also with 69 points. Jonathan Huberdeau led the team in assists and is also having a 90+ point season! And captain Aleksander Barkov came into tonight’s game 2nd in team goals (34) behind Hoffy, having tied the franchise record for points in a season (94). The final game of the season ended in the same way that the entire season transcribed… As I said, it was a weird one. After going down 3-1 heading into the 3rd period, in the 10th minute of the 3rd period, the game was stopped because Josh Brown had to beat up some Devil. He was forgiven by Jesus Christ himself when some dude in the audience, dressed as JC wearing a white robe with a Panther’s scarf as a sash, was shown on the big screen blessing a baby. Florida then proceeded to tie the game in the final minutes, sending the game into overtime on fan appreciation night. Some free hockey to go along with a bunch free giveaways, but the Panthers couldn’t end on a high note. The New Jersey Devils scored the 4-3 game-winner 0:56 seconds into overtime. Like I said, weird way to end the season. Maybe Jesus can help resurrect this team heading into next season and forgive us for our sins. One guy who was not forgiven, however, was Coach Bob Boughner. 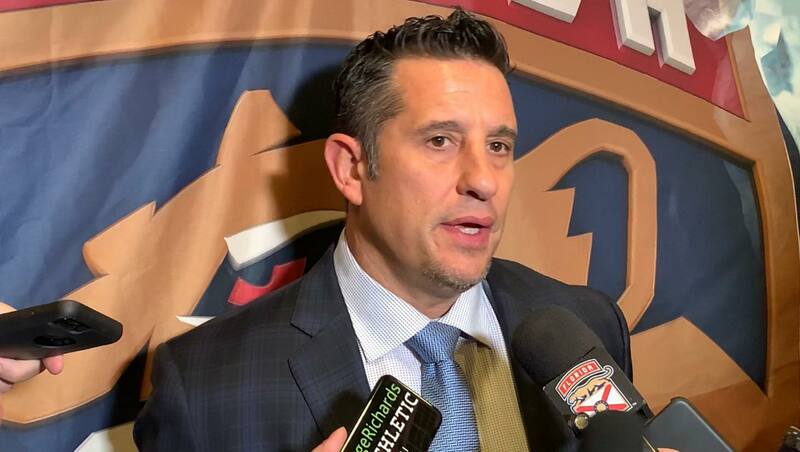 In Coach Boughner’s postgame press conference, he said that “…I think a lot of guys have had career years, and I’ve said it before, when your special teams are where they’re at, you know, top of the league in power play, and penalty kill top 10, those are recipes for success. And guys having career years and young guys developing, all those things, there’s a lot of good things, but the one thing we failed on is not getting into the playoffs, so yeah, that’s disappointing. Meanwhile, another guy that might’ve seen his last days at the BB&T, Roberto Luongo is unsure about his future with the Cats. Luongo was quoted as saying Friday, only one day after his 40th birthday, “Obviously I sill love to play the game, but there’s other factors involved”. First and foremost, I just want to sit down with management and just see where everybody’s head is at and where the team is headed next year, what they plan on doing in the offseason, all that kind of stuff… Once I find out where they’re at, then I can go back home and sit down with my family and decide what’s best for me.” If he ends up stepping away from the game, I’m sure we’ll all miss the sound of the fans in the BB&T giving out a long “LUUUUU” every time he makes a great save. The Panthers have a great young core. Barkov, Huberdeau, and Vincent Trocheck are all 25 years old or younger, and potential all-stars. These guys also aren’t the young guys on the team anymore. They’ve assumed leadership positions, and are all seasoned veterans with at least six seasons under their belts. That being said, they’re understandably tired of waiting until “next season” for their breakthrough as a team to come to fruition. The rumor mills and fan forums seem to believe that the Panthers will tap Joel Quenneville to lead the squad next season. He was most recently the coach of the Chicago Blackhawks, with whom he won three Stanley Cup titles (2010, ’13, ’15). He was also an assistant coach with the Colorado Avalanche when they defeated the Panthers in the 1996 Stanley Cup finals, Florida’s only appearance in the final. Maybe he’ll show penance and South Florida Jesus will forgive him for his past transgressions. Aleksander Barkov finishes the season with 96 points, setting a new franchise season record. Jonathan Huberdeau finished the season with 62 assists, setting a new franchise season record. Jonathan Huberdeau finishes the season with 92 points, and along with Barkov become the 1st Panthers duo to each have 90-point seasons. Only EDM and TBL have two or more players with 90 points this season. Mike Hoffman ranked top 20 in goals scored with 36. Barkov scored 35, and Huberdeau scored 30.